Stella Abraham: Support the United Way Campaign and get a "Great British Escape"
Support the United Way Campaign and get a "Great British Escape"
Come and support the United Way Campaign with a live auction hosted by Hickok & Boardman Realty. 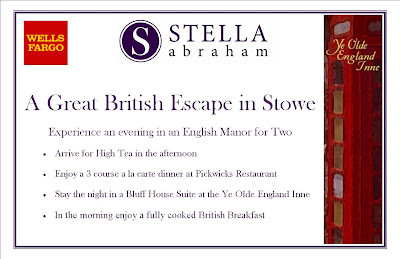 For one of the auction lots, I will be providing a night away for 2 in Stowe for a Great British Escape! It will include High Tea, a 3 course dinner, a suite in the Bluff House and Engligh Breakfast all at the Ye Olde England Inne in Stowe. The live auction will be the finale of a week packed full of fundraising lead by Hickok & Boardman. The auction will be held on Thursday Oct 30th, 4-6pm at the Sunset Ballroom at the Holiday Inn on Shelburne Road. I hope you can attend and support a great cause. If you are unable to attend but really want to bid on thsi item or any other item please call me on 802-399-4502. A full list of auction items has been posted in the foyer at Hickok & Boardman, click here for a map.